It's common for people to discuss the loss of mobility or mental clarity of seniors in association with medical conditions, but a less common topic is how it can become more challenging for older adults to eat and swallow properly. Illnesses such as Alzheimer's or Parkinson's can create issues at mealtime, or an older adult may have dentures that give them trouble. Additionally, muscles around the the airway can weaken over time, which can make it harder for the individual to clear the path. Some medications make people sleepy, which can also increase the choking risk. 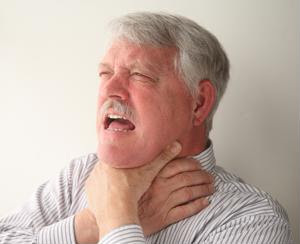 Whatever the case may be, it's important for providers of elderly home care services to learn the Heimlich maneuver in case of a choking emergency. Learning this procedure will help you stay calm in case your patient does get food or a small object stuck in their airway, and it will give you a plan of action should the need arise. Their face color changes and turns blue from lack of oxygen. They have trouble speaking or coughing forcefully. They're wheezing and having trouble breathing.